We’ve just finished our first week of school and the girls are just as excited now as they were on the first day. It’s hard to believe that we now have a second grader, kindergartner, and a pre-kindergartner! Every year that passes, the things I thought were strange have now become normal to me. So much that it seems odd to do anything but what we’re used to. After much thought and questions to my friends, I thought it would be fun to compare what it’s like for parents and kids in each country. This will actually be a 3 part series where we’ll explore the following: School Supplies, Lunch menus, and Miscellaneous. Every August, my FB feed is bombarded with videos and FB rants about how expensive it is to buy school supplies. Not only that but the ridiculous amount of supplies needed. Some teachers get very specific. A friend once told me that the teacher requested a glue stick that goes on PURPLE and dries clear. They were impossible to find in stores so she had to order them online AND she has twins so she had to buy twice as much. 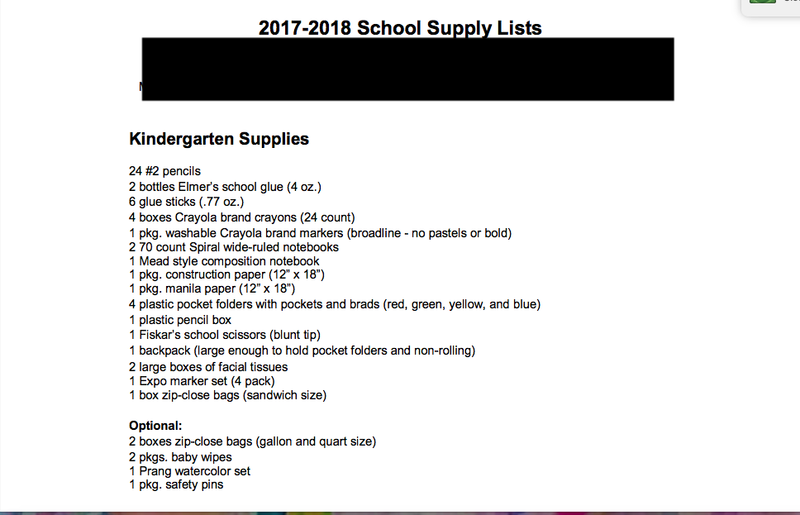 Below is the school supply list for the Pre-K & Kindergarten classes of the school district of my hometown in Texas. Can we talk about why little 4 & 5 yr olds need to have Pencils… let alone 24!! That’s insane. Most kids that age don’t know how to write their own names so why do they even need pencils? I understand the need for crayons, markers, construction paper and etc… but.. A BACKPACK.. with NO WHEELS? Those poor kids are carrying backpacks bigger than they are!! 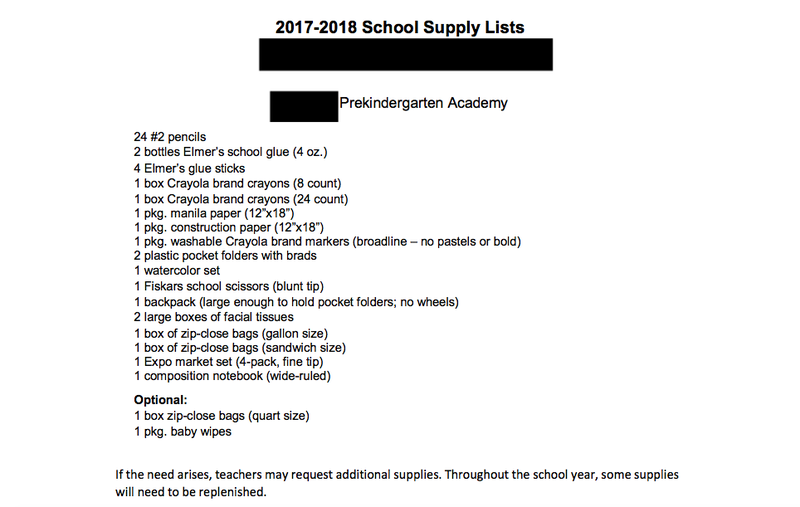 Let’s take a look at the list for my Pre-K & Kindergartner. a package of cookies/crackers to share with the class for morning snack. THAT’S IT! 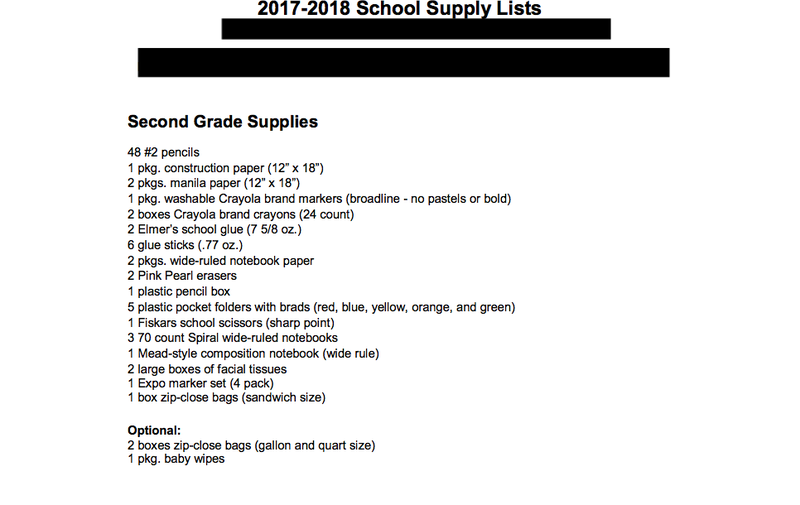 That’s the actual school supply list. There are other items but their personal stuff that I’ll get into a bit later. What is the difference here? What are American kids doing that Italians aren’t? What does Second grade look like?? Again with the pencils? 48 is a lot. During our visit to Texas, we definitely took advantage of the school sales. I was excited to see Crayola markers for $1 at War-Mart. Those same markers would have cost me almost 3€ at Carrefour and erasable pens?! ONE eraser mate pen will cost you 2-3€!! And because they mostly write in pen, if you don’t get a good quality one, you’ll be buying another one a week later. (Trust me… I know this too well) So, I ordered 3 boxes each of blue and red erasable pens. Those suckers better last me for a few years!!! 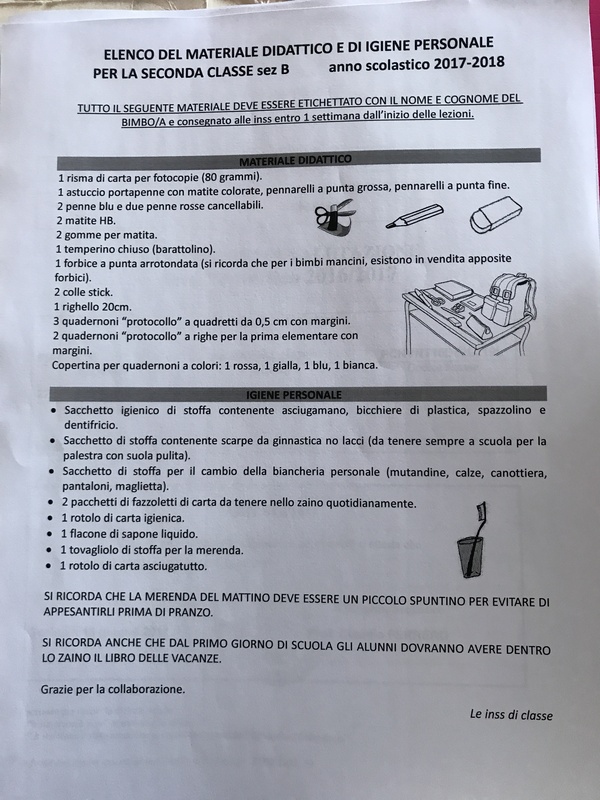 Buying school supplies in Italy can be a real pain but if you’re willing to pay a few cents extra, it can mean the difference between easy, breezy and painful and annoying. This year, I opted to get her notebooks and covers at the Cartoleria, or Paper Shop. It’s exactly what is sounds like. A shop that sells paper items and anything that may be associated with it… kind of like an Office Depot and Stationary Store merged together. The reason for this is because notebooks here come with different pages. There are specific ruled paper for 1st, 3rd and 5th grade. There are notebooks with different size squares from ,4cm to 1 cm. So instead of rummaging through piles of notebooks looking for the right one, I just ask the people at the shops and avoid any confusion on my part. So, tell me… What’s on your kids’ list? 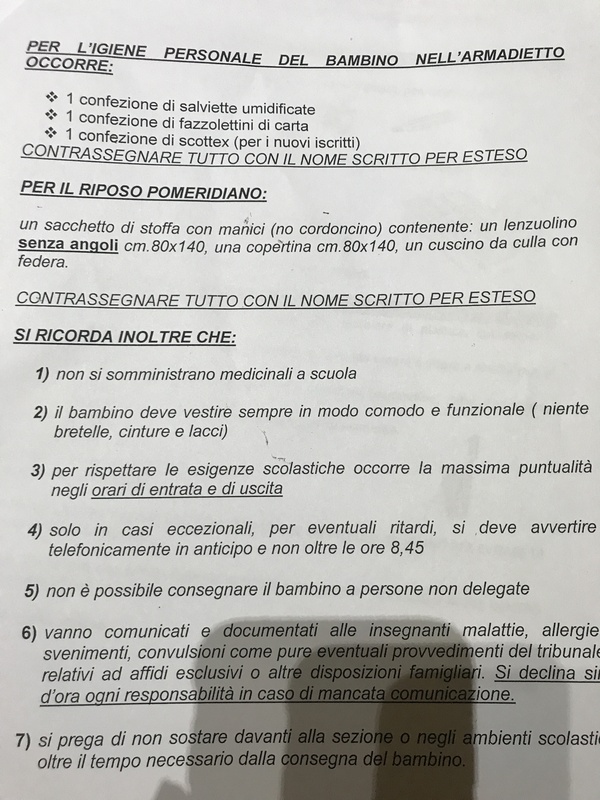 Oh, man–even the school list from the US looks like a dream to me! 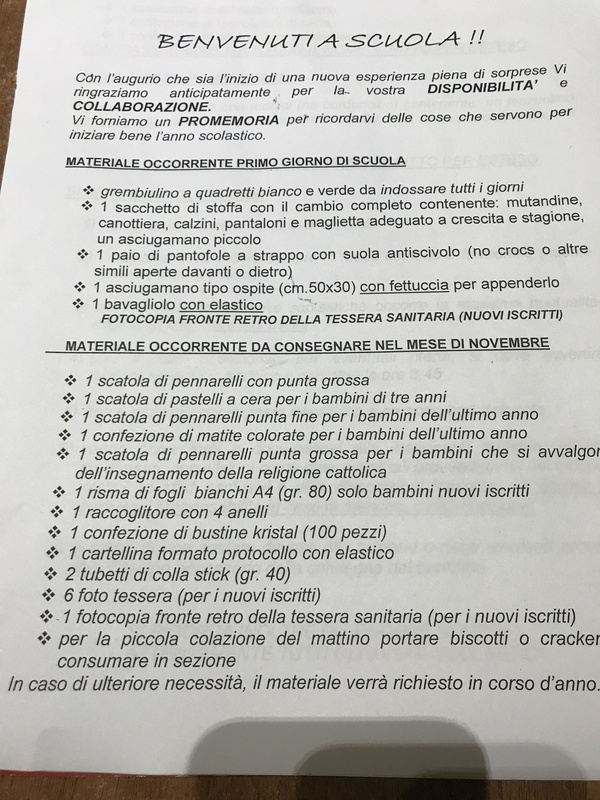 OK, it’s not so bad now in elementary school, but the Mexican preschool supply list is still unintelligible to me–after having had 2 kids in preschool for 4 years! We bring in typical school supplies, random foamy shapes, googly eyes, plastic chips, bulletin board supplies, cleaning supplies . . . I’m glad that phase is (nearly) behind me! 😉 At the same time, I just hand the list over to the lady at the stationary store, and 20 minutes later she’s got most of it in a pile by the cash register, so buying it is a breeze. I’m loving your glimpse into yet another culture! Wow… That’s insane! Is that normal for other preschools or just yours?